Today I was on a journey in our nation's capitol to do one thing - see one of the only known photographs of local historical figure Alexander Doniphan. I know that it might not work out and I was prepared to fail but I thought it was worth a try. I started off the day early - using a combination of the bus and the Metro like a real DC commuter. Like a boss I arrived at the Library of Congress on Capitol Hill right at 8:30 AM. First I had to go in and obtain a readers card - essentially a Library of Congress library card which would allow me to gain access to reading rooms. I filled out the preform online a couple of day before and when I walked in there was no line. I walked right up, showed my drivers license, took a picture and in about 1 minute I was holding my very own Library of Congress Reader Card. Now would be a good time for me to tell you a little about Alexander Doniphan. Doniphan is, in my mind, the most important historical figure ever to call Liberty home. His life is hard to summarize in a couple of sentences but he was a lawyer that helped save the life of Mormon founder Joseph Smith, Jr., lead troops from Missouri in the Mexican American War on a 5, 500 mile march, helped start the public education system in Missouri and respected by Lincoln enough that he asked Doniphan to be a general in the Union Army (which he turned down). Doniphan is respected enough to have a county, two towns, an elementary school, a highway and a World War I battleship named after him among other things. I know of only two photographs that exist of Alexander Doniphan - one is from a group photo of Mexican American War veterans taken in Liberty in 1872 at a reunion. He would have been 64 in that photo. It is a Jacob T Hicks photo and can Doniphan can be enlarged with some success but it is still not a true portrait. The only other photo that I know exists of Doniphan is a gold toned, half plate daguerreotype taken by the famed Matthew Brady studio. I have seen this photo often online and have always known it was in the Library of Congress collection but never thought I had any chance of seeing. I knew yesterday that I was going to the Library of Congress and after visiting with Sarah, a research librarian here at the Fred W. Smith Library for the Study of George Washington, I felt there might be a chance. She had suggested that I call the specific division that had possession of the photograph - Prints and Photographs - just to ask if it might be possible to obtain that specific photo to view and that I would be in sometime tomorrow to inquire about it. The gentleman that I talked to yesterday thought it might be possible and told me to stop by and he would see what he could do. This was great! I was trying not to get my hopes up but it is more like "so you're telling me there's a chance". Looking online I also found another item with specific interest to local history in Liberty, Missouri - an 1865 broadside (poster) that was a proclamation from the mayor of Liberty asking all businesses to close on April 17, 1865 due to the Lincoln assassination. That will come up later in the story of today. Armed with my new Library of Congress reader card, I looked up the way to get to the Prints and Photographs Reading Room - located in the Madison building where I had obtained my readers card. I was nervous entering the room but was soon welcomed by the staff who helped me fill out the proper forms, check all of my non approved items in a locker and was then escorted to a seat at a table where I was told they would try to locate my requested item and bring it to the table. I was still trying to reserve a little room for disappointment in my excitement. Maybe it won't be there or they would decide that I wouldn't be able to see it. Until I could actually see it I wouldn't consider it a victory but so far things were going well. Then the librarian appeared with a white box. She open the box and slid it toward me on the table. There is was. 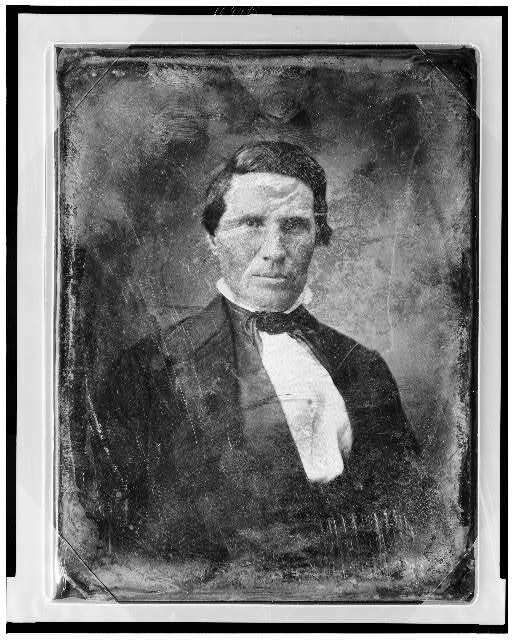 The Alexander Doniphan daguerreotype that I had only seen online. It almost didn't seem real. My first thought was that it was larger than I thought it would be. It was roughly the size of a 5 x 7 print. It glistened with a little bit of a gold tone. The photo itself is essentially a glass plate sandwiched between two other glass plates. I was told we could not take it out of the box and the librarian has to be with me while I viewed it. Taking pictures of it was allowed and I took several. The image itself is available online as a very high resolution photo so my pictures were not to use in a lesson for example, but rather to capture the essence of seeing it in person. I began to tell the librarian a little about Doniphan and she told me that she already knew quite a bit about him since she as a member of the Church of Latter Day Saints. I think she was almost as excited as me to be able to see it. I looked at it for probably about 10 minutes and took some pictures before it was sealed up and returned to catacombs of storage in the Library of Congress. I felt so good to see the image in person. His eyes are a strong feature of the photograph and he appears to have a very serious look on his face. It felt almost as if I had allowed him to see the light of day again for a couple of minutes in some strange way. Then it dawned on me that his birthday was in July - I once attended a Alexander Doniphan award ceremony in July that was held on his birthday - so I looked it up and his birthday is actually tomorrow - July 9, 1808. So my first experience requesting an item to view in the Library of Congress and it was a success beyond my wildest expectations. It will be difficult, if not impossible to every replicate that experience in the Library of Congress. The librarian confided in me that she was surprised I had actually been able to pull off the request. That fact that I had called the day before inquiring about a specific item greatly improved my chances. I had also asked the right couple of people at the right time and they said yes to me seeing the item when they easily could have said no. I walked away with the definite feeling that the stars had been aligned to give me the opportunity to see Col. Doniphan. 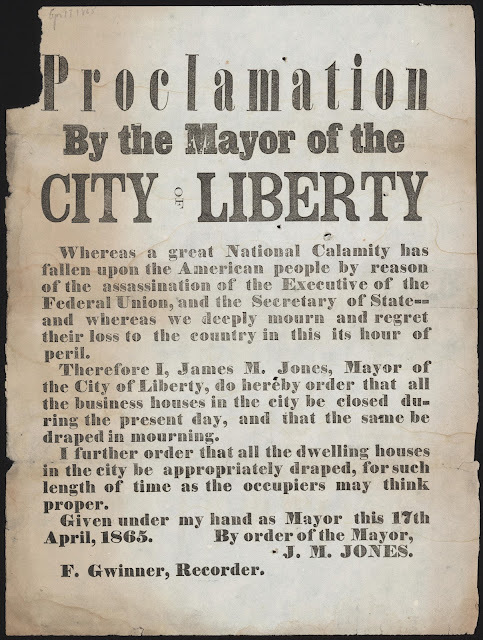 With my one major wish for the day completed by 10:00 AM why not try my luck to see if I could view the second item on my Liberty history wish list for the Library of Congress - a poster with a proclamation from the mayor of Liberty asking for businesses to close on April 17, 1865 due to Lincoln's assassination. This item was in the Rare Book and Special Collections Division, over in the Jefferson Building. I used the underground tunnel to move from the Madison Building to the Jefferson Building. Just finding the Rare Books reading room was a major accomplishment but I did find it. This would be a much greater challenge and I didn't give myself good odds of actually viewing the object. I had not called the day before and other than the curiosity of a teacher I didn't really have much scientific reason to request this rare item. I introduced myself to the librarian and explained my desire to see the specific item. I do want to note that in both of these cases I had gone online, had all of the specific information about call numbers, etc. ready to provide to the librarian and I think this helps a lot and establishes that you are not just wandering in to have them pull some random item for you. The librarian was very nice and said she would see what you could do. I filled out some more paperwork and was allowed to find a seat at a table in the reading room. This reading room was much more formal - basically only whispering and everyone was much more serious. Several people had to OK the pull of the item and as I sat there I honestly didn't know if I would be able to view it in person. I waited roughly 15 or 20 minutes and then the librarian appeared with the folder containing the broadside. I don't have a lot of background knowledge of this item and it will be fun to research in the future. It is clearing printed on a press and is in good overall shape except for a couple of tears on the edges and corners. I don't want to go into a lot of detail now since it would make a great blog entry in the future after some research but the words used in the broadside are very interesting. President Lincoln is only referenced as the "executive of the federal union" and although it says the secretary was also assassinated (William Seward) I did find that in that time period assassinate was used as a term for both the deceased in the attack and the wounded. Clay County was a very pro-confederate county and in the 1860 presidential election Lincoln did not receive an single vote for president, not a single one. This is even more amazing when you consider that Lincoln had some cousins and family members living in Liberty. The broadside is from a specific collection of Lincoln items donated to the Library of Congress from Alfred Whital Stern collection in 1960. The librarians found a copy of a catalog given to the Library of Congress when they were donated. I will be reading more about this particular broadside. With two major victories under my belt the rest of the day was clearly gravy. I took the hour long tour of the Library of Congress, I used the Main Reading Room and I saw the Waldseemuller Map - the first map which used the name "America". I visited the inside of the Main Reading Room and took pictures in the Great Hall. The building in itself is an amazing piece of art but the highlight of my day was seeing the Doniphan photo and the Proclamation by Liberty's mayor about the Lincoln Assassination. Tomorrow I will return to researching in the library here at Mount Vernon. I have a clear idea for how I want to proceed with my lesson plan after visiting with the archaeologists on Tuesday. I'm having more fun than anyone should probably be allowed to have!